Building the actual graph was a pain. If there is pain involved, it is quite likely that I am not going to make use of what I just described as very useful. So, before moving on to other learning territory, let's see if I ease the pain. 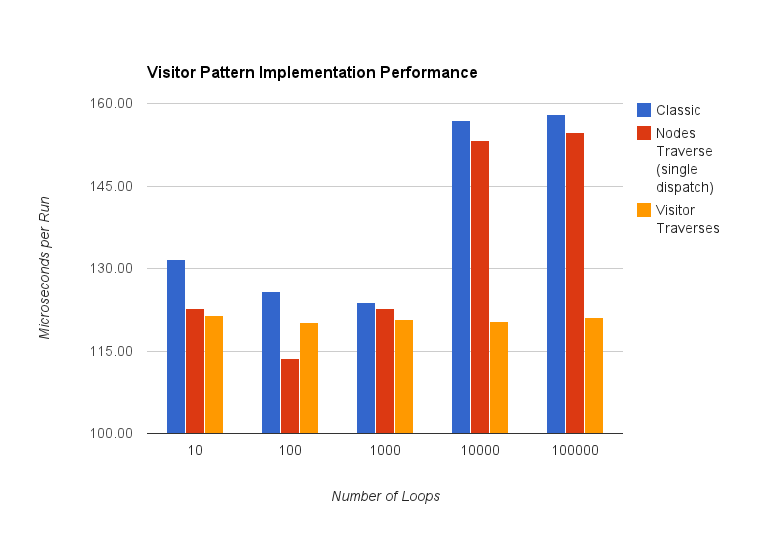 The pain involved manually copying CSV benchmarks of three different implementations of the Visitor Pattern in Dart. The benchmarking code is available in the tool subdirectory of the publicly available visitor book code for the forthcoming Design Patterns in Dart (last night's SHA1 was 14dea8561a). Step #1 should be easy—I probably should have done that myself in the Dart benchmarking code. That I did not are the hazards of plowing ahead in a solution without thinking. Step #2 was particularly hard because I had to manually edit the range of cells to be averaged and the cell that identified the number of loops. Copying and pasting always got the wrong column and or row. In a 5×3 table, that is 15 edits of 3 values. There is no way I am doing that again by hand. Step #3 may very well need to remain in Google spreadsheets. I know of no Dart packages that can manipulate Google Sheets (really?) nor are there any Dart packages that I can find that can manually build pretty graphs in PNG form. I am more than happy to be corrected on either point! Ah, my old friend constant constructors. Wait, not “friend” in this case—the loopSize is coming in from the command-line so there is no way that it will ever be a compile time constant. So there is no way to create a constant scorer. I can understand why benchmarks rely on compile-time constants like the benchmarker and scorer. No matter how many times I create a new instance, no new memory is consumed. In other words, the benchmark harness will not be responsible for triggering garbage collection. At the same time, it sure makes reporting anything more than the simplest information a pain.